If Holland & Barrett are taking part in the Black Friday sale then this is where you will hear about it, with all the top deals will be listed. In recent years the leaders in minerals, vitamins and herbal supplements have offered its customers ‘Buy One Get One Half Price’ on everything as well as 50% off selected items, they are also well known for its penny sale, so wonder what they will be offering this year in the UK? If they do decide to take part in the Black Friday sale then we will list the top deals, we would recommend you bookmarking this page and checking back on a regular basis as not to miss out. In the comments below we will update when they confirm, if you shop at Holland & Barrett please do share any deals you come across. The Holland & Barrett Black Ticket Event is now live where they are offering better than half price on selected products. Nice, thanks to the Black Ticket Event I saved a lot on my Holland & Barrett Skin Hair and Nails Formula 240 Caplets – these are normally £33.49 but I just paid £15.99. The Holland & Barrett Black Ticket Event Offering Better Than Half Price on Selected Products. 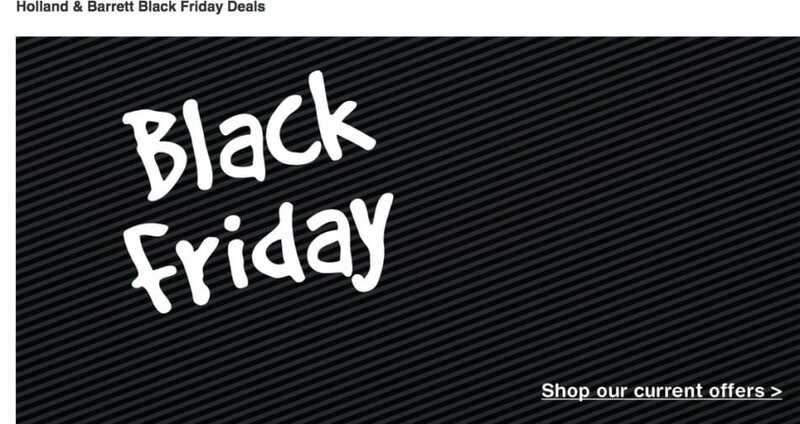 Black Friday is on 24th Nov, but when will theirs be starting. The Holland and Barrett Black Friday sale page is now live, they say their deals will begin on November 25th. Bargain, Holland & Barrett Hydrolysed Collagen Caplets 1000mg now only £12.79 down from £25.59. There are many deals on at the moment such as the half price sale on selected items.